When opened in 1979, the UK's legendary Thorpe Park was far from the thrill-seeking madhouse it is today - it wasn't until the 1990s that the land fully began to develop into a theme park for family audiences, and as the 2000s began the place was only getting better with record breaking rides and attractions. As a huge fan of the place, I have decided to draft a small list of my five favourite rides at the park. They're mostly coasters, but hey, coasters are awesome. Rush was added to the park in 2005, constructed over a period of four months to replace Thorpe Park's retired Ferris Wheel. The ride straps you in to one of two swings which gradually sway back and forth at a gently increasing speed. 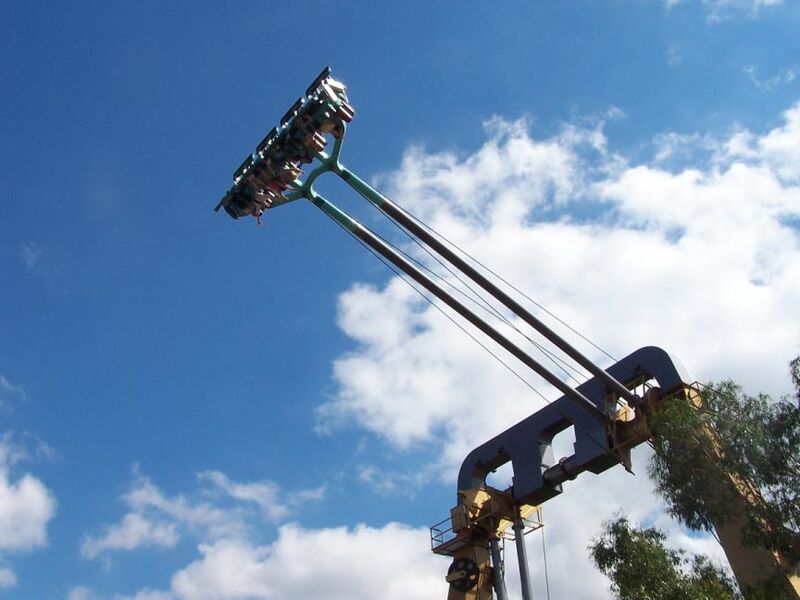 After around four or five swings, riders reach the maximum height of around 25 meters at a speed of 50 miles per hour. A simple premise and a short duration, but Rush still remains a unique ride that's both thrilling and strangely soothing. With the top hat reaching around 205 feet, Stealth is barely half the height of similar US counterparts such as Kingda Ka and Top Thrill Dragster but still remains one of the tallest and fastest coasters in the UK. When all strapped in, riders are launched at 80 miles per hour in around 2 seconds and immediately climb the top hat. You have just enough time to soil your undies upon seeing the park around you at the peak of the ride, before you shoot down the other side and glide smoothly into the station. Short, but intense. The Swarm is Thorpe Park's most recent project, opening in March 2012 after much anticipation under its tentative LC12 codename. The ride's theme is an alien invasion, with the track surrounded by smashed vehicles, ruined buildings and derelict landscapes, all of which riders speed around at about 60 miles per hour. For the 2013 season, the rear two trucks were reversed to allow guests to endure the ride backwards, which is fun but perhaps not as thrilling. With that said, The Swarm is a welcome addition to the already fantastic lineup of Thorpe Park roller coasters and easily one of their best. Any avid fan of The Inbetweeners has probably heard of this ride, which is based off a 1994 roller coaster that originally opened at Alton Towers. Riders are harnessed in seats that allow their legs to dangle as they swing around the ride, which plunges into a dark tunnel as it begins and then races around a claustrophobic track full of inversions, twists and sudden drops. Though many consider the Alton Towers version to be superior, Inferno is still a fantastic ride from beginning to end. 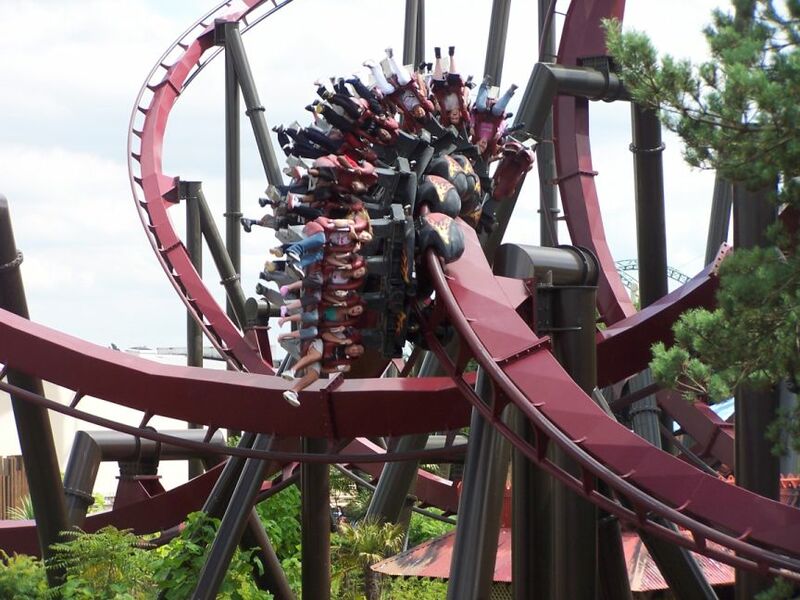 Built in 2002 at a cost of £13.5 million, Colossus held the record for the most inversions in a roller coaster until Alton Towers' The Smiler topped it in 2013. The ride boasts 10 loops throughout its 850 meter long track, including four intertwining twists as a climactic finish. Inversions are exploited in the best possible manner - the ride features 360 degree loops, corkscrews and a classic cobra roll as it thunders along the rails. Bumpy and loud, but definetly Thorpe Park's best.